If you haven’t done kitchen remodelling before, you may think it’s easy and hassle-free. It can’t be further than that. In some cases, it requires tearing a part of your house down or ripping tiles off the ground. 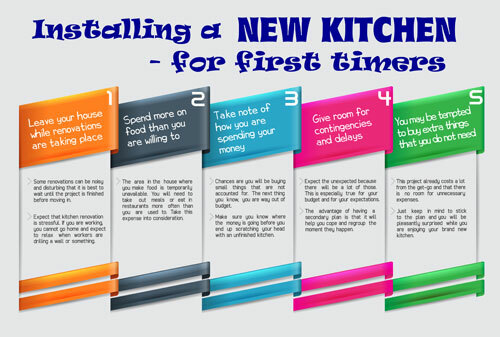 So if you want a new kitchen, better plan everything ahead if you don’t want additional stress. Here are some things to anticipate when you undertake this project. Depending on the scale of the renovation, there are instances when you need to leave the house and stay somewhere else for the time being. Some renovations can be noisy and disturbing that it is best to wait until the project is finished before moving in. With this consideration in mind, think about how much it will cost to live in a hotel or apartment for a given number of days. You may also want to take into account whether you need to rent a storage room for valuable items that you cannot leave at home while construction is taking place. If it is your first time to have a kitchen renovation, expect that it can be stressful. If you are working, you cannot go home and expect to relax when workers are drilling a wall or something. On the other hand, you can arrange the time when construction takes place. An option would be to create a temporary kitchen in an adjacent room for the mean time. The area in the house where you make food is temporarily unavailable. You will need to take out meals or eat in restaurants more often than you are used to. Take this expense into consideration. Chances are you will be buying small things that are not accounted for. The next thing you know, you are way out of budget. Even the tiny purchases that are taken out of the money you allotted for this project should be accounted for. Make sure you know where the money is going before you end up scratching your head with an unfinished kitchen. It is best to expect the unexpected because there will be a lot of those. This is especially true for your budget and for your expectations. The advantage of having a secondary plan is that it will help you cope and regroup the moment they happen. For instance, you may have planned to renovate one side of the wall only to find out you need to replace all the walls in the room. Make sure that if things like these happen, you have a backup plan or budget to use. On the contrary, if things go according to plan, then you have leftover funds in your account. This is a disaster for your budget and the last thing you want is to go beyond what you can afford. Remember that this project already costs a lot from the get-go and that there is no room for unnecessary expenses. Most first-timers commit a lot of mistakes in terms of budgeting, but the good news is it is within your control. Just keep in mind to stick to the plan and you will be pleasantly surprised while you are enjoying your brand new kitchen.